In October, sweetheart and I went to Israel. It was a life changing trip, filled with all the emotions one would expect from a trip to the land where Jesus was born, lived, died, and rose again to save us all. From the moment we landed to the last tearful goodbyes, it was such a time of sweet surrender and open hearted conversations. God was gracious and His Holy Spirit met me in the most surprising places. There are few events in my life that equal my time in the Holy Land. I went into this trip with no expectations other than to try to fill myself up with His love and mercy. I have been in such a season of brokenness. This year was one of the hardest ones I have lived in my 56 years. I keenly felt the words of Psalm 6:6 as my pillow was frequently wet with tears. The struggle to see Him in the midst of the pain was a real one. Just before leaving for Israel a box came in the mail. It was the The Broken Way by Ann Voskamp. Truthfully my heart wasn’t in doing another book review or writing another happy post about how much my life had changed since reading this or that book. I threw it into my bag however, thinking it would fill up some of the 12 hours on the airplane or the many hours on the bus between stops. Let’s just say that by the time we landed, God had once again wrapped my broken heart in His mercy and grace. As I walked the streets where Jesus walked, sat upon the sea that felt His footsteps on the waves, stood in the prison cell where He spent His last night, I could only think about the times of hardship He endured. Those moments of agonizing brokenness. The betrayal, the loneliness, the frustration with those who were supposed to be His family and friends. The sadness at watching those He loved make decisions that turned them away from the path that led towards eternal happiness. 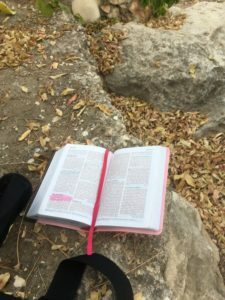 In a moment of surrender, kneeling beside a huge rock in the Garden of Gethsemane, wondering if perhaps it was THE rock, the one where Jesus sweat blood from the pain of what He must endure, I poured out my brokenness in tearful anguish. Why God? Why must I go through this again? Why must I sleep on a pillow wet with tears? Some words from The Broken Way came whispering into my heart as His mercy washed over me. Suddenly, there it was. The subtle shifting from pain to peace. That moment when He wipes the tears from your eyes and shows you a glimpse of His purpose. Here I was, walking where Jesus walked, sitting where Jesus sat, weeping where Jesus wept. Understanding flooded my senses. And so I came home changed. Not that my life is any different now. There is still the pain, the brokenness, the moments of intense agony. But now I see things in a different way. Clearer. Brighter. More aware. I also came home with a visible reminder, much like the cross that Ann draws on her wrist in the book. 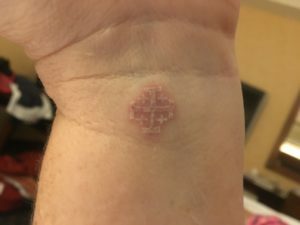 A small tattoo of a Jerusalem Cross. A statement of my commitment to Him. Usually I keep a copy of the books I review and give away a copy. But this book has so profoundly affected me that I want to share both of them with you, our sweet readers. Leave a comment, share a Facebook post, or send us a message and you will be entered to win a copy of The Broken Way. We will also choose someone to receive The Broken Way small group study with a DVD and six copies of the study. That’s 3 free gifts for 3 sweet readers! Start 2017 off right, with this great study! The Broken Way by Ann Voskamp is published by Zondervan and available at all major booksellers. Learn more about Ann Here. Follow her on Twitter and Instagram @AnnVoskamp.